Get rid of Alzheimer's by tackling this disease once and for all! 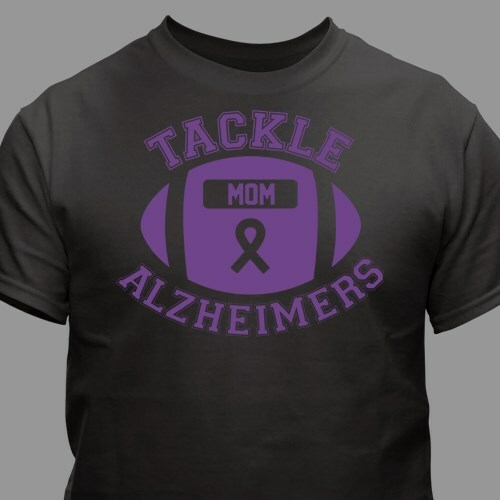 This Personalized Tackle Alzheimer's T-Shirt is a great way to show support and your never ending fight in finding a cure. This design is available on our premium 100% cotton preshrunk T-Shirt, machine washable in youth sizes XS-L & adult sizes S-3XL. Free personalization of any name is included. Fit as expected, great quality and weight. Love the design and personalization option. Customer service had a question about my order, promptly called and my order was on time. Very pleased with this purchase and service. nice quality t-shirt and the custom name looks great. This shirt run big. Oder at least a size smaller. Additional Info Let others know that you'll stop at nothing to find a cure for Alzheimer's disease. Shop MyWalkGear.com for all your Alzheimer's Awareness Apparel and Walk Gear. You'll even enjoy this design available as our Tackle Alzheimer's Awareness Long Sleeve Shirt and our Alzheimer's Awareness Sweatshirt.